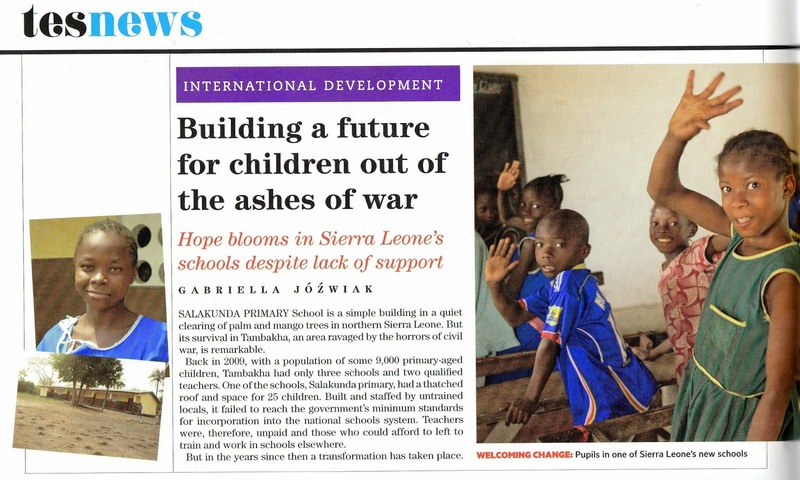 I wrote this article for TES from Sierra Leone, after visiting schools in the remote northern chiefdom of Tambakha. The schools were built by charity Street Child. Incredibly, before 2009 when the charity began working in the area, Tambakha had only three schools and two qualified teachers for 9,000 primary-aged children. Building the schools and training teachers has been an incredible achievement, but the area is struggling to maintain the institutions without government backing. I was amazed to see how hard locals were trying to support their children's education despite so many barriers. In some classes the children had no books or pencils - they were learning everything aurally. This piece was written to coincide with a Street Child fundraising campaign. A film shot during my trip explains more about the charity's work in the area. To read the full article, visit the TES website. Watch the film at about Street Child's rural schools project.